A refugee from Bangladesh, who was rescued by the Myanmar navy, is seen at a Muslim religious school used as a temporary refugee camp, at the Aletankyaw village in the Maungdaw township, in Rakhine state May 23, 2015. SITTWE, Myanmar -- The rickety internet huts have fallen silent in the crowded camps of displaced Rohingya Muslims in western Myanmar, no one comes anymore to bargain for the release of loved ones being held for ransom in Thailand and Malaysia. "Before, every day at least 10 to 15 people would come here to negotiate with human traffickers," said Tun Win, a young man who offers a video-call service from one of the bamboo and thatch huts, "Now, it's nothing." For now at least, the smugglers who preyed for years on the misery of Myanmar's Rohingya appear to be going out of business, and Asia's most acute migrant crisis since the 'boat people' exodus at the end of the Vietnam War is ebbing. For many, though, the journey ended with brutal captivity in secret camps dotted along the jungle-cloaked border between Thailand and Malaysia. From there, smugglers made demands for their prisoners' return, often haggling with relatives in those now-empty internet huts. "Everyone has run away," said Thatchai Pitaneelaboot, a police major general investigating trafficking in Thailand. More than 3,000 abandoned migrants have come ashore in Indonesia, Malaysia and Thailand in the past month, and hundreds have returned to Myanmar and Bangladesh, but the United Nations estimates that some 2,000 are still adrift at sea. The disruption of the smuggling supply chain has led to a sharp drop in boat departures, said Chris Lewa, whose Arakan Project tracks boat movements from Myanmar's Rakhine State and southern Bangladesh. Most of the would-be migrants of the last two months never sailed in the end because of the crackdown, she said. They were kept offshore and many were subsequently taken back - for a fee. Even if the Thai government has dealt a blow to the smuggling trade, many argue that only by tackling the root causes will Southeast Asia's cycles of migration stop. U.S. President Barack Obama called last week on Myanmar to end discrimination against its 1.1 million Rohingya minority. 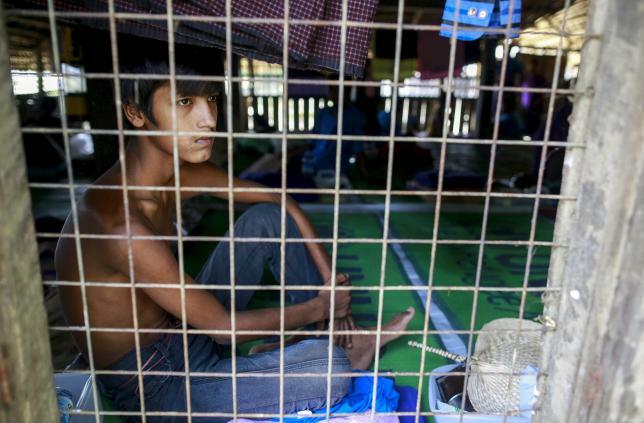 Myanmar denies it discriminates against the Rohingya. The government does not recognise them as an ethnic group and denies them citizenship. It classifies them as Bengalis, implying they are illegal immigrants from Bangladesh, even though many have lived in Myanmar for generations. The Arakan Project's Lewa is sceptical that the events of recent weeks have entirely wiped out the extortion business. "I think smaller groups of people are still being kept. Maybe not in the jungle," she said, adding that criminals may be holding migrants to ransom in safe houses. Kyaw Hla, a well-to-do member of the community who worked for distraught relatives as a fixer, said the camps really do seem to have closed. "Two months ago a lot of people were coming to me and the other rich men to sell their land and their homes to release their relatives. Such activities have already stopped," he said. In the village of Pen Daw Pyin near the border with Bangladesh, 55-year-old Se Tara said a local 'broker' told her about two months ago to prepare money for the release of her son and daughter, who had set out to sea in February. Then came news of traffickers being arrested in Thailand and boats abandoned at sea, but no word of her children's fate. Se Tara and another son, Rahamat Ullah, walked again to the broker's home, but he had disappeared. "The people in his village say they don't know where he is," Rahamat said. "I think they're lying. He's hiding somewhere."